Mod-t Cooling Duct Magnet and improved airflow by RyanTheMast is licensed under the Creative Commons - Attribution license. The original calls for a rubber band or glue to be used to hold it in place, this version uses four 8mm diameter by 2mm tall neodymium magnets instead. 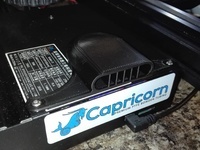 The magnets are placed over the Mod-T screws to avoid blocking any airflow. I have included 2 versions, one is a basic upgrade with just the magnet spots added for those that have found success with the original Lobo CNC design and I have also included one option of the main body and duct the should improve airflow (in theory) as it has less dead corners and flat 90 degree edges to slow down the air flow. 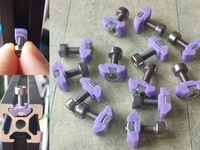 The magnet holes are intentionally a little big to allow for glue, they are recessed just enough (.4mm) to prevent direct contact to avoid any heat transfer but still close enough to give a good hold. the original design did all the hard work (thank you Lobo CNC!) and it fits well and looks great this just makes attaching and detaching a little cleaner and easier. 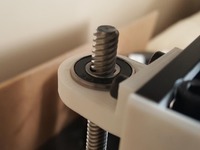 After gluing your magnets simply slide the notched area over the heat break and carefully rotate under the wires, you should not need to disconnect the extruder wires. Once it is in place slide the duct in place making sure the slot lines up and be gentle as to not break the thin duct attach point. Push up to get a clean fit and you should be ready to print! Worth noting, I noticed after I made this that a maker by the name of Deaxe attempted something similar by directly gluing his magnets to the original. https://www.thingiverse.com/make:493432 Just wanted to make sure to give notice for the similar idea that came first. 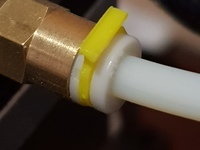 I used PLA and it works fine but a more practical option would be to print on another printer and use a more heat resistant material like nylon or abs, or just anneal the PLA but you'll need to compensate for shrinkage if you do that. I used cyanoacrylate glue and a kicker to attach mine. Just make sure to not over fill with glue the goal is to have the magnet ever so slightly recessed to avoid direct contact with the metal plate which may heat up during use.